The PCE laser distance meter is the ideal device to ascertain the measurements of distance without bulky reel-in tapes, or walking wheel distance measurement systems. 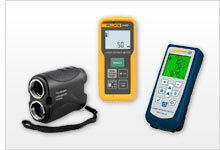 The PCE laser distance meter is made to the highest industry standards for resolution and durability. The laser distance meter is used for accurately determining the distance of an object or span without contact by way of a laser. The basic measuring principle is based on measuring the transit time of laser pulses between the laser distance meter and the object to be measured. Considering the speed of light, distances can be determined precisely with a laser distance meter. Moreover allows this principle the determination of very large distances in the kilometer range. Additionally, the laser distance meter can accumulate independently to calculate surfaces and volumes. The laser distance meter is the ideal device for a civil engineer, and any other large scale operations in which distance measurement accuracy is paramount. The laser distance meter is frequently used in the industrial sector and especially with professions relating to construction, such as carpentry, masonry, electrical, landscapers, developers, locksmiths, etc. This laser distance meter is attractive due to its ease of use and its high level of accuracy in the results recorded. A PCE laser distance meter is made of high strength lightweight plastic and comes with a suitcase carrying case, depending on the model, it also may come with a Leica lens, the World leader in producing optical distance measuring meters. The laser distance meter can measure and store the readings to a memory and determine the surface, the volume or height showing these on its display. The laser distance meter is an instrument for testing distance in situations where no other measurement instrument can possibly do, for instance in a military operation where stealth is key, the laser distance meter can procure the distance from or to a target location silently and invisibly. We also offer a laser distance meter for fixed mounting for multiple applications in the industrial sector such as position testing, testing coil weight, etc. This laser distance meter transmits digital or analog readings to a PC or a PLC-System for further analysis or as the basis for controlling commands. With the laser distance meter PCE-LDS 70, you can measure fill levels of containers, positions of workpieces on conveyor belts or thicknesses of rollers. You can also store and evaluate the data on your PC or connect the laser meter PCE-LDS 70 for control and readout to a PLC. The laser distance meter PCE-LDM 45 is suitable for simple distance measurements. The laser distance meter PCE-LDM 45 measures distances up to 40 m / 55.8 ft. All measured values ​​are displayed on the very legible, illuminated display. The units can be selected by the user. The laser distance meter PCE-LRF 500 is an optimal tool for distance measurements in the leisure sector. The laser distance meter PCE-LRF 500 is therefore very well suited for determining distance on hikes, bike rides or hunting. The laser meter PCE-LRF 500 has a measuring range of up to 600 m / 1,968 ft.
PCE-LRF 600 is a metric-only rangefinding distance meter that not only measures distance, but also determines the speed of moving objects. Ideal for hunting, shooting, golfing and more, these compact laser rangefinding binoculars make great gifts for sports and outdoor enthusiasts. The optical laser distance meter (sensor) ODSL 30 RS232 model covers a vast application range. For example the optical laser distance meter (sensor) allows positioning transfer cars, cranes, lifting facilities. Even a measurement of the volume can be performed by measuring in two dimensions with simultaneously moving the object can be performed by means of the optical laser distance meter (sensor) ODSL 30 series. There are different editions of the optical distance sensor purchasable. The optical laser distance meter (sensor) ODSL 30 RS485 output model covers a vast application range. For example the optical laser distance meter (sensor) allows positioning transfer cars, cranes, lifting facilities. Even a measurement of the volume can be performed by measuring in two dimensions with simultaneously moving the object can be performed by means of the optical laser distance meter (sensor) ODSL 30 series. There are different editions of the optical distance sensor available for purchase. The optical laser distance meter (sensor) ODSL 30 analog output model covers a vast application range. For example the optical laser distance meter (sensor) allows positioning transfer cars, cranes, lifting facilities. Even a measurement of the volume can be performed by measuring in two dimensions with simultaneously moving the object can be performed by means of the optical laser distance meter (sensor) ODSL 30 series. There are different editions of the optical distance sensor purchasable.